Hello guys, I'm XMBC user due to simulate microsoft mouse magnifier bottom function with a non-msn mouse. I'm using a old Dell USB mouse and I want to put magnifier.exe at central click bottom (wheel click). Then, I've setup wheel click with magnifier.exe and it's working fine to magnifier ON. But pressing wheels again to magnifier OFF is not working. Is it possible to simulate a magnifier OFF pressing wheel again as a msn mouse? How are you doing it? - toggle magnifier on/off works fine here! 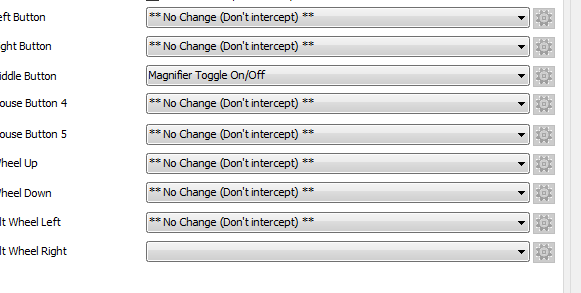 Yes, wheel click is configured with Magnifier Toggle ON/OFF (see below). But, just ON is working. When clicking again OFF is not working then magnifier is not disabled. Odd - what version of Windows, xmbc etc. OS Language? Working here on win 10 with 2.14. Can you try turning on debug logging, and the closing the setup window and try the button a few times, the send me the log or paste the content here. See below log paste with some wheel clicks. 29-09-2016 19:20:39.0421> Loaded 0 application specific profiles (0 normal and 0 custom window). 29-09-2016 19:20:39.0437> Warning: Low Level Hook Timeout is low. If you have problems try increaing this value. 29-09-2016 19:20:47.0859> CMyMessageWnd::OnSetup   -   Opening setup dialog. 29-09-2016 19:20:47.0859> Loaded 0 application specific profiles (0 normal and 0 custom window). 29-09-2016 19:21:09.0656> Enabling extra debug logging. 29-09-2016 19:21:09.0656>   There are 0 application specific profiles (0 normal and 0 custom window). 29-09-2016 19:21:11.0984> CMyMessageWnd::OnSetup   -   Setup dialog closed. 29-09-2016 19:21:11.0984>   There are 0 application specific profiles (0 normal and 0 custom window). 29-09-2016 19:21:14.0703> Removing message 0x0207 from mouse hook queue as we have overridden it. 29-09-2016 19:21:14.0765> Removing message 0x0208 from mouse hook queue as we have overridden it. 29-09-2016 19:21:16.0000> Checkversion: Skipping version check as we are within 5 days of last check. 29-09-2016 19:21:19.0453> Removing message 0x0207 from mouse hook queue as we have overridden it. 29-09-2016 19:21:19.0718> Removing message 0x0208 from mouse hook queue as we have overridden it. 29-09-2016 19:21:20.0421> Removing message 0x0207 from mouse hook queue as we have overridden it. 29-09-2016 19:21:20.0703> Removing message 0x0208 from mouse hook queue as we have overridden it. 29-09-2016 19:21:21.0281> Removing message 0x0207 from mouse hook queue as we have overridden it. 29-09-2016 19:21:21.0484> Removing message 0x0208 from mouse hook queue as we have overridden it. 29-09-2016 19:21:22.0109> Removing message 0x0207 from mouse hook queue as we have overridden it. 29-09-2016 19:21:22.0328> Removing message 0x0208 from mouse hook queue as we have overridden it. 29-09-2016 19:21:22.0609> Removing message 0x0207 from mouse hook queue as we have overridden it. 29-09-2016 19:21:22.0750> Removing message 0x0208 from mouse hook queue as we have overridden it. 29-09-2016 19:21:23.0906> Removing message 0x0207 from mouse hook queue as we have overridden it. 29-09-2016 19:21:23.0062> Removing message 0x0208 from mouse hook queue as we have overridden it. 29-09-2016 19:21:23.0500> GetProcessName(7 WindowFromHWND): Error 5 in GetProcessName(). Unable to get name for PID 8104, HWND 0x00030B02 (5): Access is denied. 29-09-2016 19:21:24.0859> GetProcessName(7 WindowFromHWND): Error 5 in GetProcessName(). Unable to get name for PID 8104, HWND 0x00030B02 (5): Access is denied. 29-09-2016 19:21:25.0015> GetProcessName(7 WindowFromHWND): Error 5 in GetProcessName(). Unable to get name for PID 8104, HWND 0x00030B9C (5): Access is denied. 29-09-2016 19:21:30.0406> CMyMessageWnd::OnSetup   -   Opening setup dialog. 29-09-2016 19:21:30.0406> Loaded 0 application specific profiles (0 normal and 0 custom window). Just a quick though - can you try running XMBC as admin and see if it then works? I think this might be another user elevation issue - ie. unable to close a higher privilege window (magnifier) - which might explain why it works for me! When checking "Run as adminsitrator" flag, toggle OFF is working fine!!! WIth file with adm flagged it's unable to starting xmbc process with windows start despite off the process is included in startup menu itens. Unflagging "Run as administator" and doing a new reboot, the process was perfectly started with windows. Yes, it's confirmed with "run as admin" flagged xbmc process is not started with windows. My user is local admin. If you set XMBC to always run as admin, it will have problems at startup because you can not avoid the UAC prompt - maybe that's why it does not work in that way. But I see you have installed in d:\program files - that location is not trusted by the OS so is probably the problem. User accessibility tools *have* to be installed in c:\program files or some functions, such as this will not work. Try re-installing in c:\program files and I bet that fixes the problem! It's working fine after reinstall at C:. without necessity to grant ADM permission. I have a 32 Gb msata SSD Disk (C:) and a 256 Gb SATA SSD Disk (D:). Then, I've installed basic OS at C: (Windows and basic software) and all another Apps at D:. This is the reason to have installed XMBC at D:. RE:Just a quick though - can you try running XMBC as admin and see if it then works? I think this might be another user elevation issue - ie. unable to close a higher privilege window (magnifier) - which might explain why it works for me! Phil you are a genius. Thank you. I registered just to post this. For anyone else with magnifier on/off only working for going on, run xmouse in administrator mode and this will fix it. Thank you again Phil. I was going crazy trying to copy over all the xmouse files from my old windows install to the new one because I had it working but completely forgot about this.